For 24 years I was a smoker. That's nearly a quarter century of inhaling smoke into lungs that are probably black by now. But I loved it. I'd start the day with a smoke and a coffee, and I'd have that last cigarette at the end of my day. When my partner and I were expecting our first-born, I finally made the decision that I was ready to stop. I come from a long line of smokers on both sides of my family. When I grew up it wasn't uncommon for parents to smoke in the house, on long car rides and, of course, in restaurants. Cigarettes were omnipresent, and by the time I was 15 years old I was a smoker myself, happily inhaling smoke into a pair of lungs that had been exposed to second-hand smoke since childhood. For 24 years I was a smoker. That's nearly a quarter century of inhaling smoke into lungs that are probably black by now. But I loved it. I'd start the day with a smoke and a coffee, and I'd have that last cigarette at the end of my day. I just couldn't find the will power. And then, finally, I found something that helped me quit for good. When my partner and I were expecting our first-born, I finally made the decision that I was ready to stop smoking. I had tried a few different strategies by this point but nothing did the trick. I was still a smoker when my son arrived, and remained one until he was a year old. I just couldn't find the will power. And then, finally, I found something that helped me quit for good. No more need for cigarettes with my coffee, or that last smoke at the end of the day. Vaporizers have been around for a few years now. The nicotine delivery system is a harm reduction strategy, found to be 95 per cent less harmful than actual cigarettes according to most scientific research. There are only four ingredients -- vegetable glycerin, artificial flavor, propylene glycol and nicotine. By comparison, cigarettes contain over 4,000 chemicals, 43 of which are cancer-causing compounds and another 400 are considered toxic. Put simply, there really is no basis to compare the two products except to say that both are inhaled by the consumer. Oh, one other thing: governments across North America are passing legislation that equates the two as both being a public health hazard for its citizens. In Ontario, the Kathleen Wynne government has passed Bill 45, a measure that places vaping on par with smoking, despite the obvious differences between the two. 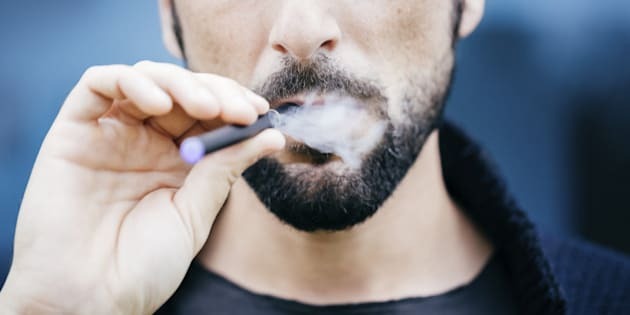 Thousands of people across the country have credited vaporizers for helping them kick the habit, yet legislation like this ignores the obvious benefits and fictionalizes the science in order to ban vaping in public wherever cigarettes are banned. I'm not one to use the phrase "nanny state," but I can't think of a more appropriate phrase to describe a government who insists on ignoring science so it can ban a product that has successfully helped more people to stop drawing smoke into their lungs than any other cessation strategy in history. Groups like Vapor Advocates of Ontario are currently engaged in an ongoing battle, challenging the government to take cues from the British Royal College of Physicians who are encouraging smokers to use vaping as a way to successfully quit smoking. Instead, as Kathleen Wynne promotes the semi-privatization of alcohol distribution, a substance known to kill tens of thousands of people a year, the Ontario government is stubbornly insisting that vaporizing is exactly the same thing as smoking, despite the building consensus among the scientific community that vaping could eventually be credited as saving thousands of lives annually. One has to ask what the motives are for governments to behave this way. Some ministry lawyers have cited odd theories such as vaporizers being considered a gateway product that will eventually cause children to start smoking cigarettes. Unfortunately for those peddling this theory, smoking among teens continues to plummet. Other government officials will cite studies that have long been refuted, an odd way of trying to provide citizens with legitimate reasons for banning something that is not in the public good to ban. Last month a friend of mine attended a protest at Queen's Park, demanding the Wynne government abandon its stubborn legislation against vaping. While there she met countless ex-smokers, young and old, who universally heralded this new technology as "life-saving." Most of them cannot understand how a government can merely ignore the testimonials from ex-smokers. Since that protest articles have come out exposing the link between tobacco lobbyists and government fundraisers, as well as Wall Street documents that connect rising tobacco stocks with legislation banning vaporizers in public, similar to the legislation passed by the Wynne government. And yet, the Ontario government remains unconvinced. But politics aside, my partner couldn't be happier. I can feel the difference physically, too. I have been a non-smoker for nine months. I can breathe in deeply, I don't cough as much, my clothes and hands don't reek of cigarette smoke, and my son will never know what his daddy looks like with a cigarette hanging out of his mouth. Also, I have lessened the levels of nicotine and expect to be vaporizer-free within the next year. By that time my second child, a daughter, will be born. Both of my children will be the first generation in our family to be born without a parent who smokes cigarettes. Honestly, what's more important than that at the end of the day?